A CTE that references itself is called as recursive CTE. Recursive CTE's can be of great help when displaying hierarchical data. Example, displaying employees in an organization hierarchy. A simple organization chart is shown below. 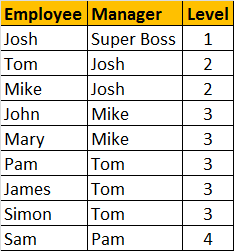 Let's create tblEmployee table, which holds the data, that's in the organization chart. Since, a MANAGER is also an EMPLOYEE, both manager and employee details are stored in tblEmployee table. Data from tblEmployee is shown below. Let's say, we want to display, EmployeeName along with their ManagerName. The ouptut should be as shown below. To achieve this, we can simply join tblEmployee with itself. Joining a table with itself is called as self join. We discussed about Self Joins in Part 14 of this video series. 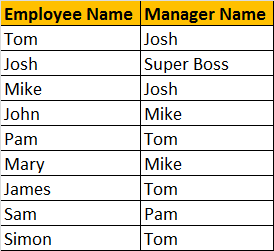 In the output, notice that since JOSH does not have a Manager, we are displaying 'Super Boss', instead of NULL. We used IsNull(), function to replace NULL with 'Super Boss'. If you want to learn more about replacing NULL values, please watch Part 15. Along with Employee and their Manager name, we also want to display their level in the organization. The output should be as shown below. We can easily achieve this using a self referencing CTE. The EmployeesCTE contains 2 queries with UNION ALL operator. 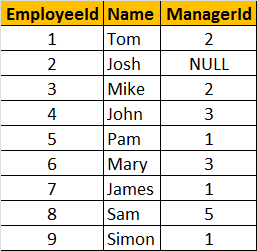 The first query selects the EmployeeId, Name, ManagerId, and 1 as the level from tblEmployee where ManagerId is NULL. So, here we are giving a LEVEL = 1 for super boss (Whose Manager Id is NULL). In the second query, we are joining tblEmployee with EmployeesCTE itself, which allows us to loop thru the hierarchy. Finally to get the reuired output, we are joining EmployeesCTE with itself. Your video's are excellent and meaningful. Thanks so much for so easy understanding tutorial but in this page I think left join is easy to use for this query instead of CTE. Left join query is shorter to write than writing this recursive CTE which even use the same left join. and yeah thank you Venkut I like this tutorials, but you said that we are going to be talking about Database Schema in a latter session. Since EmployeesCTE4 yields no results, this implies a stopping condition. Theoretically, a recursive CTE can be infinite, but practically, SQL Server tries to forbid the queries that would lead to infinite recordsets. Then result is very different. please explain. Please explain the other method to implement the same result.It will be very grateful!! !